A roach is the remains of a joint, blunt or roll up cigarette after most of it has been smoked. Small metal clips to facilitate the smoking of a "roach" are called roach clips. In Europe, the United Kingdom and most Commonwealth nations, "roach" can also refer to a bit of rolled thin cardboard in one end to serve as a mouthpiece - called a "filter" in North America. 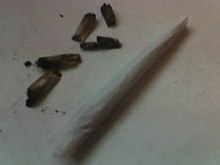 When this is employed, a joint can still be held securely after it has burnt down to a short length; thus, the entire length of the joint may be smoked without the aid of a roach clip. In Spanish, tabaco de cucaracha ("roach tobacco") refers to powdery, low-quality tobacco. Roaches found in cars, etc and in a few cases embedded in the soles of shoes have been responsible for several drugs convictions in the UK and Channel Islands, despite in some cases other evidence being circumstantial or coincidental. ^ "Roach". Thefreedictionary.com. Retrieved 9 April 2018 – via The Free Dictionary. ^ "The Free Dictionary". Thefreedictionary.com. Retrieved 29 March 2016. ^ Arooka. James Bong's Ultimate SpyGuide to Marijuana. Free World Press Ltd. pp. 178–. ISBN 978-0-9738928-0-2. ^ Real Academia Española. Diccionario Usual. This page was last edited on 21 February 2019, at 08:18 (UTC).